Return of the update feed! Since @RustUpdates was shut down a couple weeks ago, the community has had much less insight into what’s being going on with Rust development. Thankfully, a new version of the update feed went live today! With a very minimal look, this feed shows the author, time (when hovered on author), message, and branch of each commit, sorted by day (newest on top). It also shows the number of files added, modified, and removed - although that’s not very important for the casual observer. I also asked Alistair about getting an RSS feed hooked up to allow for more integrations - he’s looking into it (fingers crossed). Edit: The design has been updated a couple of times since writing this. There's now a more table-like layout, no more numbers, and the timestamp is always visible. Going live this week, the skin caching branch has been merged. Latest in optimizations from Andre, this functionality will hopefully lessen hitches and improve performance related to custom skins. Petur is back full time on Rust and working on some drastic shifts to the Hapis island map. Reworking the entire topology of the west coast, he’s replacing those filler cliffs with a new cliff wall with winding paths and mines. This is the first in many topology changes planned for Hapis. 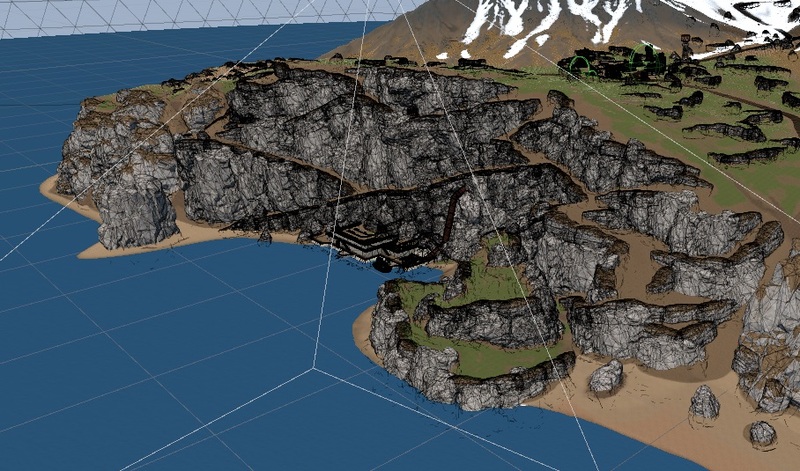 Petur shared with me that he plans on eventually implementing something similar to all low mountainsides - adding cliffs and winding paths which can obscure little bases, as opposed to being totally open like it is now. He told me to expect these changes to hit prerelease sometime later this month. Stay tuned for more over the coming weeks.